THE GOVERNMENT HAS agreed plans to implement the 1979 referendum result to expand voting rights in Seanad elections to all graduates of third-level institutions in Ireland. Cabinet ministers today agreed to the drafting of an amendment to electoral law which would see the creation of one, six-seat constituency known as the “Institutes of Higher Education”. All holders of degrees or equivalent qualifications from Irish universties, Institutes of Technology, private colleges and bodies such as the Royal College of Surgeons will be eligible to vote under the changes. According to the most recent census data around 740,000 people asserted that they have a third-level degree, but this would need to be confirmed in order for a person to be eligible to appear on register of electors. Opening up of the electorate for six Seanad seats would significantly increase the numbers eligible to vote. Around 150,000 people from the Trinity and NUI universities were eligible for the last Seanad elections for the two university panels, but there was a low turnout in both institutions. The general scheme of a bill to amend the Electoral Act will be considered by the Seanad itself, the Environment Committee, and the higher level institutions before proposed legislation is brought before the Oireachtas in the coming months. At present, no other reforms to the Seanad have been considered by the government. Earlier the Agriculture Minister Simon Coveney said that reforms broader than widening the third-level franchise are needed. Opposition parties today criticised the planned changes, Sinn Féin senator David Cullinane said that extension of the university franchise “does not constitute meaningful and genuine reform”. Fianna Fáil leader Micheál Martin said that this was not the reform that people demanded when they rejected the referendum to abolish the upper house in October. “There is now a unique opportunity to introduce real reform and give the Seanad a meaningful and more challenging role in the Oireachtas,” Martin said. Email “All third-level graduates to get vote as part of Seanad reforms agreed by Cabinet ”. 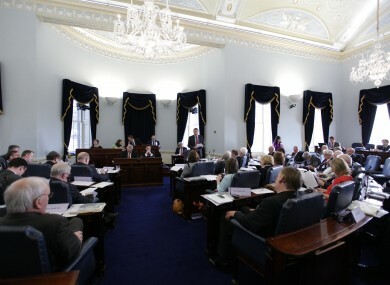 Feedback on “All third-level graduates to get vote as part of Seanad reforms agreed by Cabinet ”.